The Incorporated Village of Wayne is a residential community with an April, 2010 population of 2,431 residents (U.S.Census), nestled within the landscape of the Fox River Valley in the counties of Kane and Dupage, Illinois. Dunham Castle, the Dunham Woods Riding Club, and the "village" are the key features which symbolize the tradition and heritage of Wayne. The first permanent settlers came to the area now comprising the Village of Wayne in 1834. The Wayne area had been the scene of campaigning during the Black Hawk War, and the old cemetery lying amidst the fields of the old Dunham south farm is a relic of those early days. Until 1850, Wayne Township's thirty six square miles had been entirely agricultural with one exception the small community at Wayne Center east of Illinois Route 59. In 1850 the westerly advance of the Galena and Chicago Union's strap rails dramatically altered the development of Wayne, for it brought new settlers to Wayne Station (now the:"Village of Wayne"). The post office in Wayne Station was established in 1853 and by the turn of the century Wayne Center had been supplanted as the principal community. Solomon Dunham, who was a surveyor as well as a farmer, established the pattern for settlement of Wayne Station when he built an inn, a store, a house, and dedicated land for a public road. By 1865, Mark W. Dunham, the youngest son of Solomon, had begun breeding and selling prize Percheron horses which he originally imported from France. By 1883 he had over 1,300 mares and stallions grazing on 1,700 acres of land known as Oaklawn Farm. His residence, Oaklawn, now popularly known as "Dunham Castle", was also constructed as part of the farm, and the red brick building which had been the Dunham home (now the Dunham Woods Riding Club) was converted into offices for the farm and guest rooms for visiting horse buyers. Along the main street of the "village", houses were being built to accommodate the families of merchants and men who worked in various capacities for the Oaklawn Farm and the Chicago and Northwestern Railroad. Today, Wayne "village" and Oaklawn Farm along with Dunham Castle are listed as historic districts in the National Register of Historic Places. The Wayne Road, renamed Army Trail Road in the early 1950's, provides a unique link between the two historic districts. In 1893, Oaklawn Farm was accorded the honor of serving as one of the agricultural displays for the World's Columbian Exposition in Chicago, and visitors traveled Wayne Road from Wayne Station out to the Broad expanse. The old railroad station still exists and has been returned to its original site in the Village Center. By 1905, Oaklawn Farm produced more Percheron horses for American and European buyers than the next eight establishments combined. As automobiles and trucks replaced draft horses in the 20th Century, the Dunham family joined with certain other landowners to convert their farms and woods to a rural residential community with minimum lots of four acres. They created and, for many years, maintained private roads and bridle paths. Oaklawn Farm's office building and barns were sold to a group of residents who formed Dunham Woods Riding Club in 1934 and, after World War II, the Castle was converted into a multi family rental unit with spacious grounds. The Castle has now been returned to single family use. 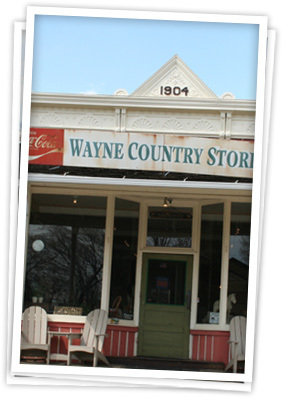 While some of the residents of Wayne are natives, the majority of the present families migrated to Wayne because it offered a rural, relaxed atmosphere. It is one of the few communities in northeastern Illinois that provides and encourages equestrian uses and facilities. An outstanding characteristic of the Wayne Community has been a strong sense of volunteerism, or citizen participation in local affairs. As far back as 1850 Solomon Dunham gave the new Galena and Chicago Union Railroad, now the Chicago and Northwestern Railroad, the land it required for its tracks and station. On November 17, 1937, before there was any formal zoning in rural Kane County, the Dunham and Norris families, plus certain other landowners, entered into a mutual agreement concerning the development of their properties on the west side of Dunham Road. A key feature of this agreement was a restriction of land use to single family residences on a minimum of four acres each. This voluntary zoning has been honored ever since and was upheld by the Kane County Circuit Court in 1990. Virtually all of the area, which fronts approximately a mile and a half along Dunham Road and up to three-fourths of a mile west of it, has since been built on, or at least platted in units of four or more acres.